Drainage and filtration are primary functions of all geotextiles. These porous fabrics allow water to pass through them and away from an area while retaining or filtering out sediments. Using them alone or in conjunction with other products can enhance a traditional granular filter system or completely replace it altogether. However, in order for a drainage structure to be effective its design must match the dynamic hydraulic and soil conditions of the area. In the late 1970’s, the Army Corps of Engineers established guidelines for the use of geotextiles as filters. From there it became an accepted practice by transportation authorities and engineering communities. The permeability of the geotextile fabrics must be greater than the permeability of the soil to allow the passage of water at high rates. It must also retain soil particles without clogging and be strong enough to survive construction without damage. Need help choosing a geotextile or geosynthetic product? Please contact us at 609-971-8810. We welcome the opportunity to answer your questions and assist you in selecting the right geotextile for your next project. Constructing a drainage system along the edge of a roadway or embankment is as simple as lining a gravel-filled trench with a lightweight nonwoven geotextile. More complex drainage systems can utilize prefabricated geocomposite drains and/or a network of buried pipe wrapped in filter socks. Typical applications include airfields, athletic fields, landfill leachate collection systems or to keep water away from critical structures. The use of an underdrain system can significantly extend the performance and service life of a roadway or structure. Permanent erosion control systems provide wave protection for shoreline embankments and causeways along with scour protection of drainage structures, ditches, bridge piers and abutments. Woven monofilament geotextiles make an ideal synthetic filter for these systems due to the uniform and measurable openings in the fabric. They are also capable of withstanding the construction of the system without damage. They are ideal for use with traditional rip-rap or modern geosynthetics such as geotextile tubes and geocells as well as gabion and reno mattresses. In addition, vegetating or covering these systems maintains the natural beauty of the area. Dewatering filter bags and tubes effectively collect sediments from wastewater ponds, lagoons, construction and dredging project sites. Whether a custom or stock size, they are suitable for any size project. Filter fabric selection depends on sediment type. The sediment-laden water is pumped into the fill port and filtered through the geotextile fabric. The filtered water can be collected and further polished or discharged back into an acceptable location. The material remaining in the bag or tube is easy to remove for off-site disposal or reuse on the site. 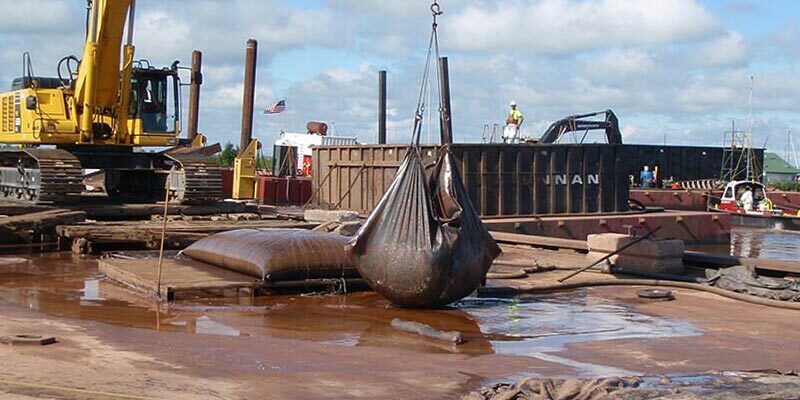 Dewatering filter bags are a cost-effective and environmentally friendly method of drainage and filtration of silt and sediment before it reaches our waterways. specific project requirements such as flow and sieve size, we determined a custom high flow filter bag would be required. To maximize the flow without binding, we placed the inlet port on top of the dewatering bags. In addition, we added an impermeable neck to cut down on leaking. To allow the bags to be lifted we added support lifting straps and corner loops to help secure the bags in place. At IWT Cargo-Guard, one size fits all is not our motto. 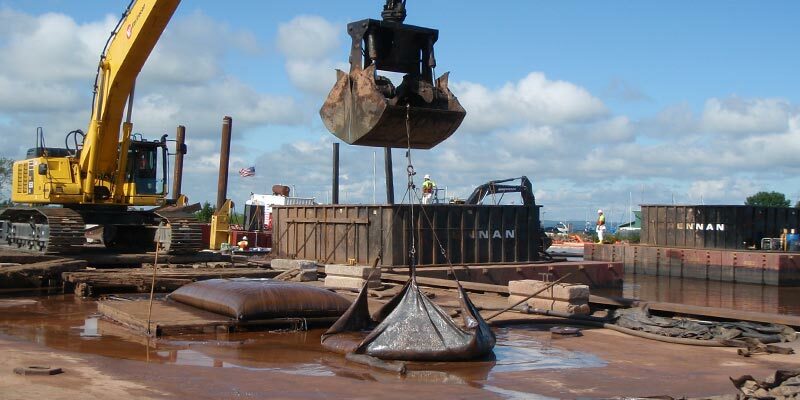 Different sites have requirements that are unique to the type sediment and specific requirements of the project. Call us at 609-971-8810 so we can help design a custom dewatering filter bag for your next project.